If you have seen the Game of Thrones, you are probably familiar with the Dark Hedges. This location was featured prominently in the highly popular HBO series. If you are a big fan of the show, or if you just want to see this amazing grove of trees in person for yourself, then this is the guide for you. Avoid the Crowds – Make sure you plan enough time to spend at the Dark Hedges because the crowds can be quite thick at times. The Game of Thrones has made this site very popular and at times it can be nearly impossible to get a good shot without people in it. Visit at Sunrise or Sunset – The Dark Hedges is at its best when the light is softer and dimmer. Don’t get me wrong, the hedges is an amazing place to visit at any time. However, if your goal is to photograph it, you will want to visit early or late in the day. Bring a Tripod – If you do visit either early or late in the day, you are going to need to use a longer exposure to properly capture the detail in the shadows of the tree. For this reason, a tripod is an essential piece of equipment that you will want to have with you. Bring a Wide Angel Lens – You are going to want to have a wide angel lens with you when you visit the Dark Hedges. To get the best shots, you are going to want to be in close to the hedges, if not inside the beginning of the row of hedges. A wide angel lens will assist you in capturing the full breath of the scene. The Dark Hedges are located near the Northern coast of Northern Ireland, about 49 miles North of the city of Belfast. The Dark Hedges are located near a number of other wonderful attractions that are on the coast of Northern Ireland. These attractions include the Carrick-A-Rede Bridge, the Giant’s Causeway, and the Dunluce Castle (pictured above), which I have highlighted previously on this blog. Northern Ireland is an amazing place to visit year-round, but like most other places in this world, certain times of the year are better than others. In order to assist you in determining which time of year would be best for you to make your visit, I have outlined several weather and tourism factors below to help you make an informed decision. While Northern Ireland is blessed in that the temperature typically doesn’t get too hot or too cold for comfort, the temperature does fluctuate throughout the year. In fact, throughout much of the year the temperature seems to hover right on the threshold of being too cold to not have a jacket, but too warm to wear it. To give you a better idea of what kind of whether you can expect on your trip, I have included a chart below that outlines the average high and low temperatures throughout the year. As you can see by the chart below, Northern Ireland tends to get quite a bit of rain throughout the year. This is especially true along the coastline. If you are looking to avoid the rain, I would suggest targeting the late spring months of April and May as they tend to see the lowest amount of rain during the year. Northern Ireland tends to get a fairly steady stream of tourists from the rest of the UK and elsewhere in Europe throughout the year, but it sees the number of tourists from North America and elsewhere around the world steadily grow throughout the spring into summer. The peak tourist months for Northern Ireland are undoubtedly the summer months of July and August. If you are looking to avoid the crowds, I would suggest you look at visiting sometime between November and March. 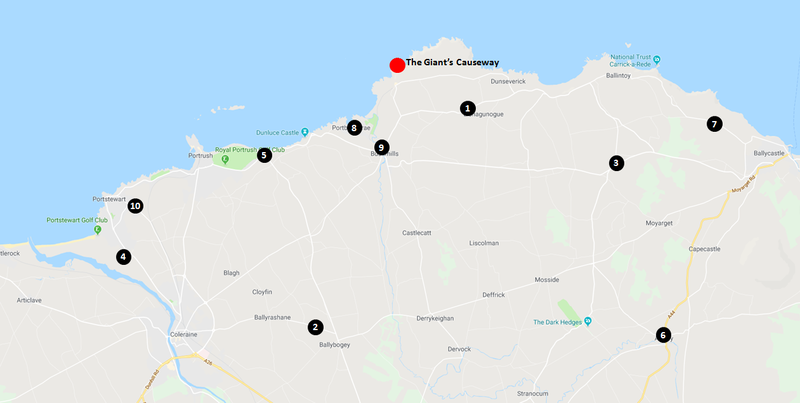 There are quite a few tourist attractions bunched up into one small area on the Northern coast of Northern Ireland, so I would recommend staying somewhere in that area to be close to all of the sights. To assist you in finding the right accommodations for you, I have included a list of recommended hotels and other accommodations and different price points for you to review below. The Dark Hedges is such an extraordinary place. If this amazing location looked surreal on the Game of Thrones, just wait until you see it in person. Below is a gallery of some of the images I was able to take when I visited the Dark Hedges. Thanks for reading Leya! I am sure your pictures are amazing! Thank you for a lovely comment – but no, I had no tripod either.